The Pacific Northwest Intercollegiate Marching Band is officially on its way to Dublin, Ireland to take part in the St. Patrick's Day Parade this Friday. The band is made up of members from the University of Washington, Washington State and University of Oregon Marching Bands. For Dr. Brad McDavid, Director of Athletic Bands at the University of Washington, this trip is a dream come true. "We have all considered doing the Dublin St. Patrick’s Day Parade but could never commit due to the fact that for many of our institutions, it falls either during finals week or the NCAA Tournament, or in the case of the UW, both!" he said. "So I approached my colleagues here in the Northwest and asked what they thought about combining our bands so that our students might finally be able to experience the parade and they all loved the idea. So we applied a year ago as the “Pacific Northwest Intercollegiate Marching Band” and a few months later were excited to find out that we were accepted." The bands have all rehearsed separately and will join forces together in Ireland this week. Each band and student did their own fundraising to get there with some having to raise as much as $3,000 to participate. The trip almost didn't happen. With winter storm Stella dumping snow in the northeast, many members were notified that their flights were cancelled as they connected out of New York and Boston. Luckily, they were able to reschedule everyone's flights. Instead of flying together the members now are on 9 different flights with connections all over the world. They should all arrive by Friday for their performance. such as the Macy’s Parade and the Inauguration Parade, may become a realistic goal.," McDavid told us. 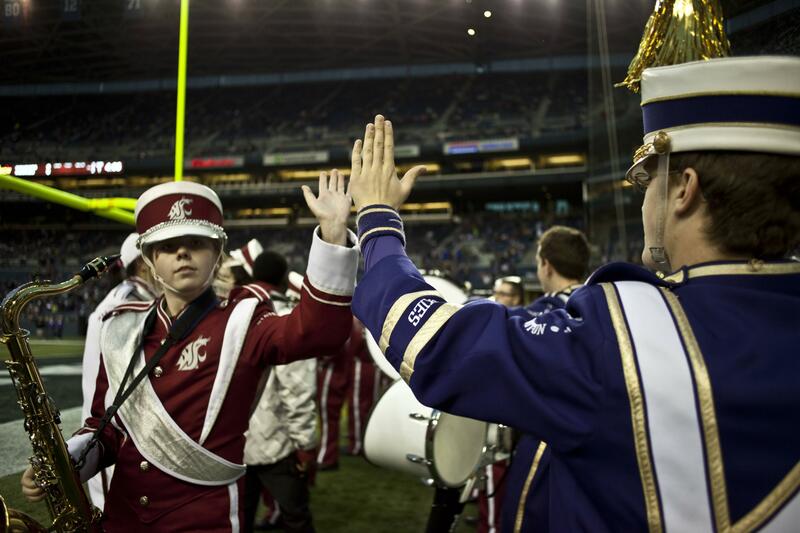 "I’m sure I am speaking for Troy Bennefield (at WSU) and Eric Wiltshire at Oregon when I say that we are all really excited to be representing the Pac-12 and American collegiate marching bands in general. But we’re equally as excited to see some of our students having the chance to view a beautiful part of the world and participate in this world-renowned parade" said McDavid. The Illinois State University Big Red Marching Machine will also be marching in the parade and competing in the Limerick international marching band competition. The Purdue University Marching Band will march in next year's parade.